A recent storyline on the Shotime series ‘Shameless‘ has focused on the show’s protagonist being charged with a crime for the first time. Fiona Gallagher, Shameless’ lead played brilliantly by Emmy Rossum, is charged with narcotic possession and child endangerment when a child in her care accidentally ingests drugs at her home. In my opinion, the portrayal of the indignities she suffers and choices she is faced with are for the most part realistic depictions of a first time offender’s interaction with the criminal justice system. I think this storyline is laudable, because it is an aspect of the law often overlooked in popular culture (TV shows and movies tend to focus on corporate legal proceedings and capital crimes it seems). When Fiona is arrested, she is brought to jail awaiting her arraignment. Shameless unflinchingly outlines the discomfort and invasion of privacy one endures in jail. Something I hear almost every day in my office is ‘One night was enough, I will never go back.’ The arraignment is shown next, accurately so as well. Fiona is unable to retain counsel so her bond ends up being set high. Bond, for those who don’t know is an insurance policy that you will return to court for future dates. I’ve found that people who retain counsel have a better shot at getting a reasonable bond, even where they are charged with a felony. Fiona then struggles with her public defender. While the public defender seems very well versed in nuances of Fiona’s charge, she’s spread thin. This can certainly happen in real life. Public defenders can get very large caseloads that they have to stay competent on and split their time between. There are a lot of capable public defenders, much like Fiona’s, but access to them can be a real issue as shown in Shameless. Subsequently, Fiona struggles with whether or not to take a plea deal. She thinks that the State has her dead-to-rights on the possession issue but feels that she didn’t do anything to endanger the child in her home. Nonetheless, she is offered a plea disposition that likely takes jail off the table. A big part of criminal defense is negotiating pleas and advising clients on their merits. 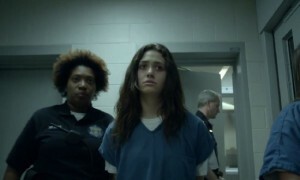 In Shameless, Fiona probably had a losing trial. She was guilty, there were a lot of witnesses, and she didn’t have a viable defense. Given that jail was certainly on the table, a deal was at least worth a conversation. Clients and lawyers have to weigh the probability of success at trial versus the sure thing before them. Fiona hems and haws over this, and ultimately cops a deal admitting guilt before the judge. Fiona is sentenced to 3 years probation with a conditional house arrest tether. For a felony this seems more or less on point for what I see in the court system. For a felony conviction it’s normal, in Michigan, to receive 12 to 36 months probation. Her reporting, three times a month, struck me as steep but that may be the standard in Illinois. Personally, we see Fiona struggling with her loss of freedom and diminished role in her family. Probation serves different objectives. It is designed both to punish and rehabilitate. Probationers often become dejected over the enormous infringement of freedom they endure. Nonetheless, courts almost universally view probation as a favor being granted in lieu of straight jail time. Overall, I commend Shameless for its largely accurate depiction of this difficult and oft-neglected topic in pop culture. Fiona’s experience as a first time offender is something we deal with regularly in our practice. We attempt to identify and sympathize with the frustration, fear, uncertainty, and anger our clients experience when they find themselves in a similar position.